A cold Sunday dusk in January, and I take my four-year-old daughter, Arielle, to see wolves. We walk the Northern Trail’s footpath where it curls downhill towards Aurora Avenue’s north-south traffic. I want Arielle to enjoy wolves as much as I do, and so we journey into the Woodland Park Zoo’s tundra and taiga exhibit, a seemingly unbroken swatch of hillocks and white spruce, black spruce, paper birch, and aspen that obscure fences and camouflaged moats. A long time before Arielle’s birth, I was a zoo docent who wheeled a display cart laden with mountain goat skulls and a wolf pelt to an area informally called the North American Yards, rarely noticed by visitors hurrying to reach the old North Entrance’s parking lots. There I enjoyed solitary, enchanted afternoons on the look-out balcony, positioned above and far away from wolves I’d watch charging across a grass and dandelion field. The wolves would be stopped short by a chain-link fence; on the other side, a Roosevelt elk bugled a challenge as his harem grazed nearby. I trace my affection for wolves to Barry Lopez’s Of Wolves and Men, read when I lived on the other side of the country, which refined my inchoate hope of becoming a writer into instead becoming a nature writer. 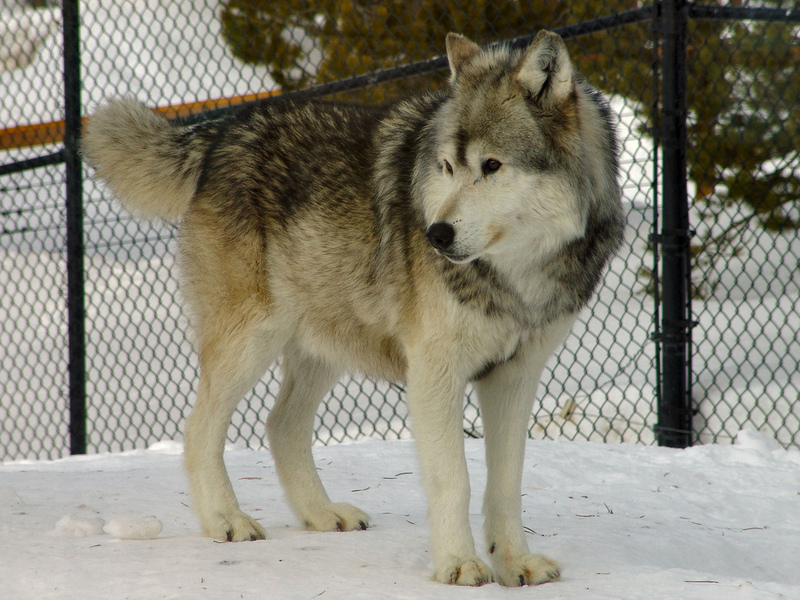 Before volunteering at the zoo, I was a tour guide at a refuge for abandoned wolves, mainly ex-circus animals or former pets too acclimated to humans to be sent to the wild, a place none had ever experienced. There I sat on Mima mounds and meditated amid sharp grass growing alongside Teddy Bear’s and Sung’s metal fence; I slipped my fingers between metal links and scratched Colorado’s tense shoulders and slowly relaxing ears; I petted Lucan and Clementine—elderly and devoted as a canid Baucis and Philemon—and watched, each spring, as they rubbed off their white winter coats by gliding along their black fence, thick tufts trapped amid metal links. On this day, though, the sky darkens grey, the air swirls cold, and the wolves waking up are different from the ones I knew years ago. Four grey wolves, each with a black spot on its tail, rouse and rise, shake and stare. 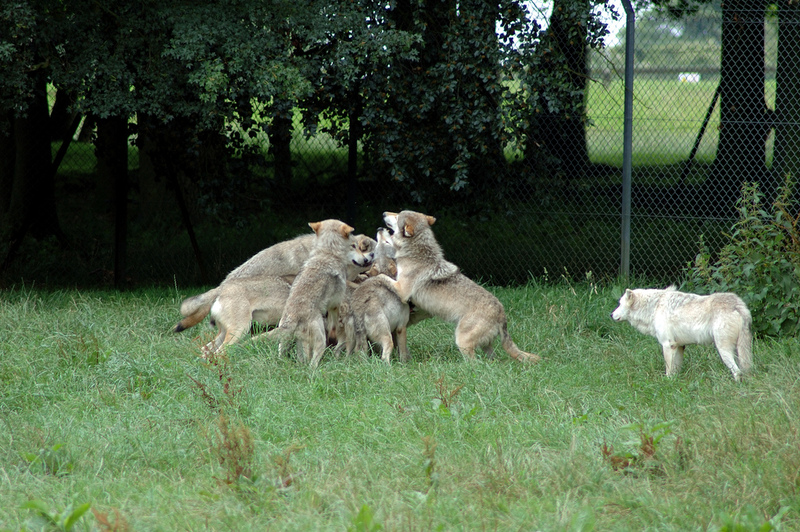 The wolves walk across the grass and dirt ground of their enclosure, shaggy and shoving and snapping at each other, alert and eager. The wolves turn away; they pivot; they make a slow run for the metal fence. They stare. My muscles tense. My breathing goes deep, slow. The wolves stare at Arielle, who’s small and squealing with joy as she runs slightly too far away from her mother. Arielle doesn’t notice the wolves. She runs in pink sneakers to where a sculpture of wolf pups not much larger than she emerges from a metal den. The real wolves watch Arielle. Arielle giggles and slips and yells. The wolves pace. They stare. Arielle’s pink raincoat and pink mittens are muddy. Her blonde head bobs with excitement. Her pink-trimmed fleece hat with its pink pom-poms jerks to and fro. I watch the wolves watch Arielle. I consider the height of the metal fence. I wonder if it’s electrified. I survey the thickness of the bushes between us, the firmness of the sloped ground between their enclosure and a second, wooden fence flanking the footpath, where I stand on the other side. So long ago, whether at the North American Yard or at the wolf refuge, the barriers held. On the one side, me, safe and human; on the other side, them, safely contained and not wild any longer. 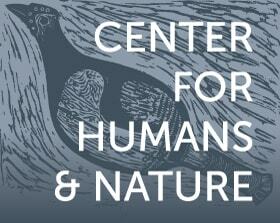 For don’t they say zoos dampen the wild’s fierceness, destroy its essential nature? And don’t they say motherhood softens a woman’s interests, re-directs her to nurturing and nuzzling? Somewhere they were saying this as I watch the wolves’ jaws open and their pace quicken. I see Arielle as the wolves see her: a young animal who’s clumsy, who’s loud, who hasn’t learned to be cautious in the wild world, who’s meant to be culled from her herd by the sharp, slicing claw of natural selection cleaving her from her inexperienced mother. But something had jumped fences in me not so long ago. I brought Arielle into this world; I knew there was no safe place here. My pregnancy had been difficult; Arielle’s premature birth had been hard; our first years, worse. I fought with doctors, nurses, Family Resource Coordinators; I found my sharp teeth; I discovered my ready claws. I defended my daughter, as the wolves would have defended their pups. One wolf breaks the silence with a long, low howl. Other wolves join in; I purse my lips and howl out a mournful note. We howl back and forth, and Arielle, giggling, joins from our side of the fence. People gather, holding popcorn and soda pop; their Androids and iPhones whirl pictures. The howling ends. One wolf jumps another, larger wolf that’s missing a patch of haunch fur. The wolves swarm, pushing and jawing the neck of the pack’s lowest ranking member. Finally the submissive wolf snaps back and slinks away. .
We follow the trail as it curls past martens and magpies in mesh-enclosed micro-habitats, past snowy owls and grey owls, past grizzly bears sleeping alongside viewing windows, past river otters sliding down glass-enclosed waterfalls, past Arctic foxes capering below mountain goats who are leaping across rocky slopes, past Steller’s sea-eagles and rehabilitated bald eagles that will never fly free again. We dead-end at the Roosevelt elk look-out. We start back up the trail. Twilight darkens toward night. Crows gather in the conifers. Crows call. “Time to go see Daddy,” I say. 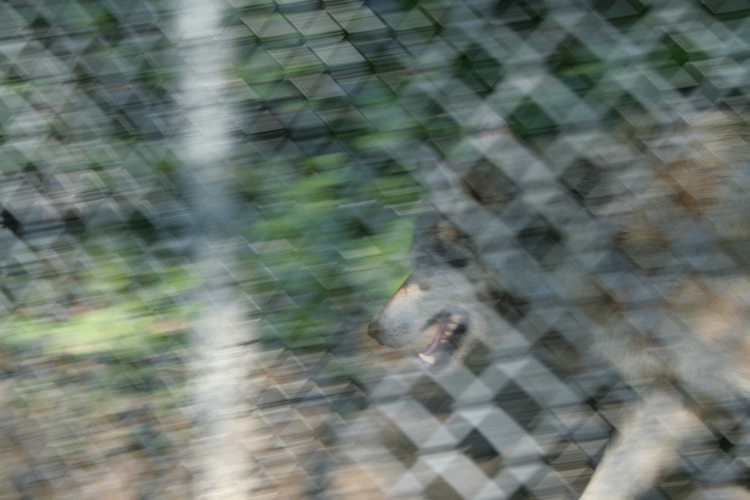 Arielle runs past where the wolf enclosure’s metal fence is low and just a few feet from the wooden fence. Arielle laughs. The wolves watch Arielle. I watch the wolves. We’re all hungry. For food? Or something more basic? Arielle runs past a family with boys in a stroller, past interpretive signs, past bathrooms, and out the former North Entrance. Only my firm grip slows her down as we cross Phinney Avenue where Daddy waits at the coffee shop, his black Kosovo laptop open to Stockcharts.com, a white paper bag of pink and purple macaroons beside him. It’s five-dollar-burger-and-fries night at the local diner. We’ll eat there as we do every Sunday. The fences have held. There’s no need to howl. Not today at least. Photo credits (top to bottom): Dennis Matheson, "wolf" (CC BY 2.0); davebloggs007, "Walking with the wolves" (CC BY 2.0); Neil McIntosh, "Wolf Pile" (CC BY 2.0).